The Visiting International Student Program (VISP) offers you the opportunity to study at the University of Wisconsin-Madison for one or more academic terms. Participants enroll in regular university courses taught by world-class faculty at one of the nation’s top public research universities. 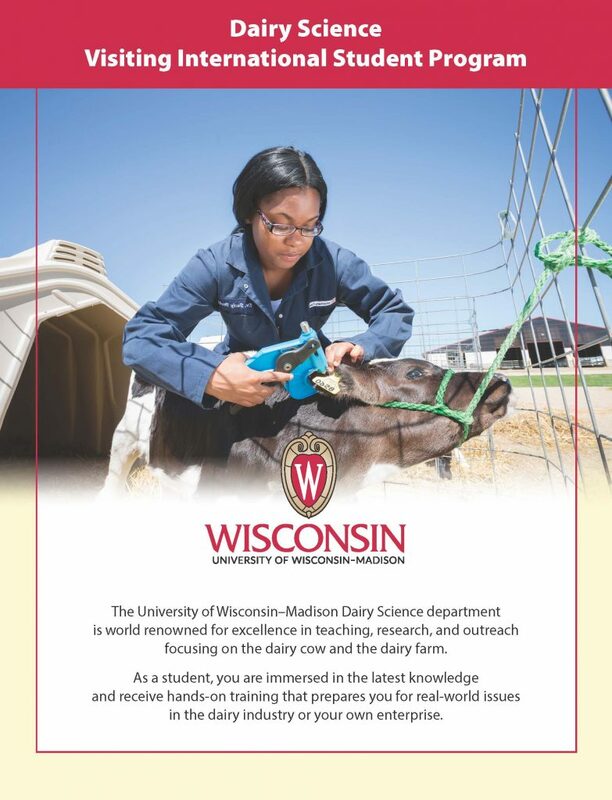 The University of Wisconsin–Madison Department of Dairy Science is world renowned for excellence in teaching, research, and outreach focusing on the dairy cow and the dairy farm. As a student, you are immersed in the latest knowledge and receive hands-on training that prepares you for real-world issues in the dairy industry or your own enterprise. Experience the UW–Madison Dairy Science Visiting International Student Program (VISP)! You may start at any semester of the year (fall, spring, or summer) and are guaranteed courses for full-time enrollment. Choose from a variety of quality courses to create your optimal learning experience. Program participants will be able to apply their studies to many fields including research, academics, industry, and production. From the time you apply to the end of your stay, the VISP staff is here to assist you. As a VISP participant, you have complete access to all of UW–Madison’s academic and student support services, such as libraries, computer labs, clubs, and sports facilities. You may also participate in VISP-sponsored social and cultural events. Upon completion of the Dairy Science program, you receive an official UW–Madison transcript. As a VISP participant, you are held to our university’s high standards and therefore must be admitted to UW–Madison as a non-degree student and be proficient in English. Information about tuition and living expenses are available from the VISP program. Dairy Science VISP also offers tuition reduction coverage for qualified students.